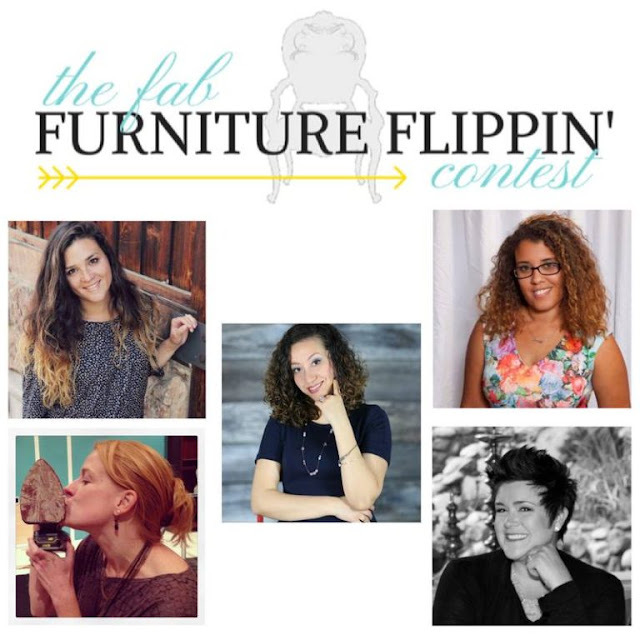 Last month, I entered the Thrift Diving 30 day room makeover challenge. It was a lot of fun but very challenging. 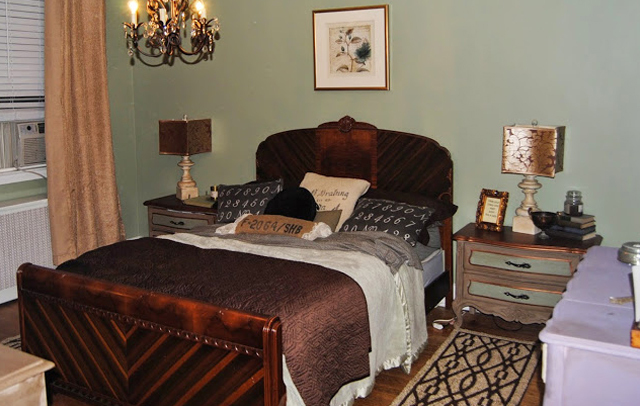 I decided to do my master bedroom, which was a huge decision for me because the rest of my house is not done yet. My room is usually last on the list, behind the kids' rooms and all the main living spaces. However, I'm beginning to realize that it's a mistake to put myself last. I really need a peaceful retreat where I can relax and unwind at the end of the day. Just in case you forgot, here are the before pictures. I painted my wall a warm green color, it is from Valspar. I think it goes well with my art deco bed. Fortunately, the wood on the bed was in very good condition, so I was able to leave that as is and build the room around it. I got the picture above my bed on sale at Home Goods. I did not change the lamps, but I painted the end table with a mixture of paints, including Modern Masters in a metallic bronze color on the top, and two different brands of chalk paint for the base. 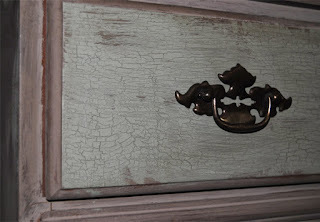 I used a crackle on the drawer fronts. 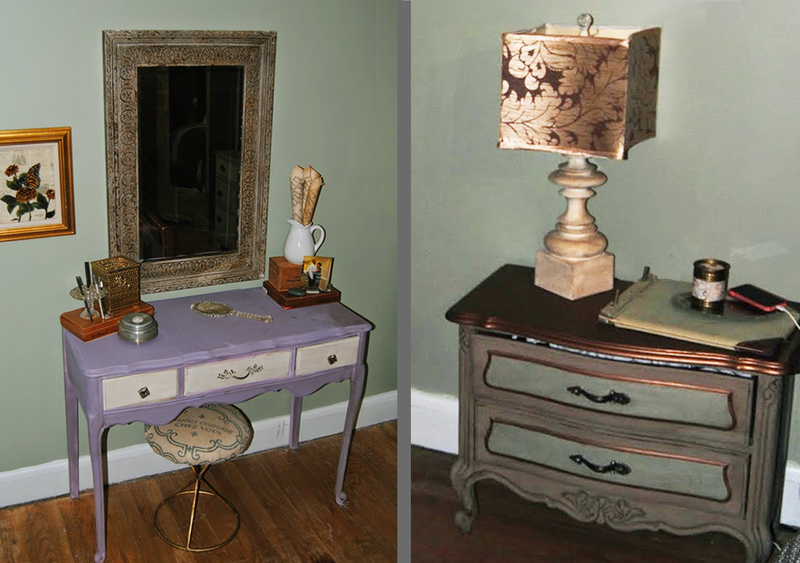 My vanity got a paint job in AS Emile, with a dark wax and old ochre drawers. 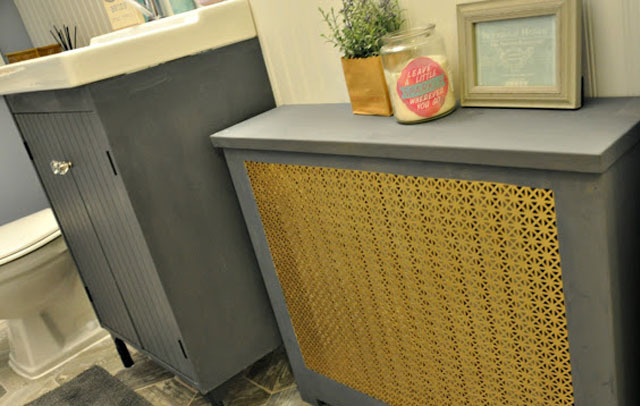 It is a little too girly for me, so I will be switching it out for another vanity in a few weeks, once I can get the other one out of my garage! 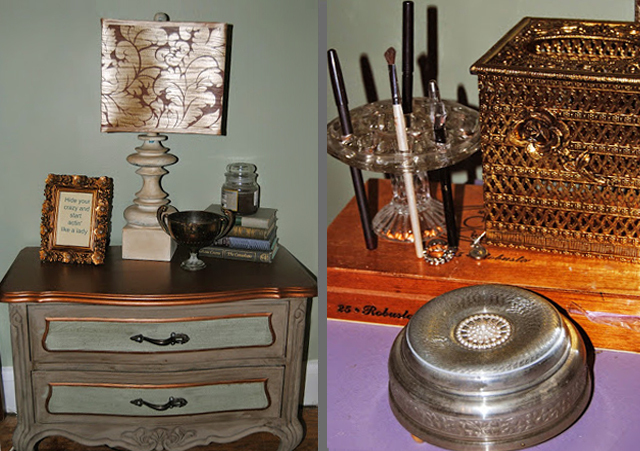 You'll also notice a vintage silver plated container on the end table that I put my change in. I got it from a Goodwill. I absolutely LOVE silver plated items. I used a glass form and epoxied it to a candle holder to use to hold my makeup brushes and eye liner. The armoire turned out beautifully, although it was hard to take a picture of because of the metallic sheen I put on it. So you'll just have to take my word for that project! 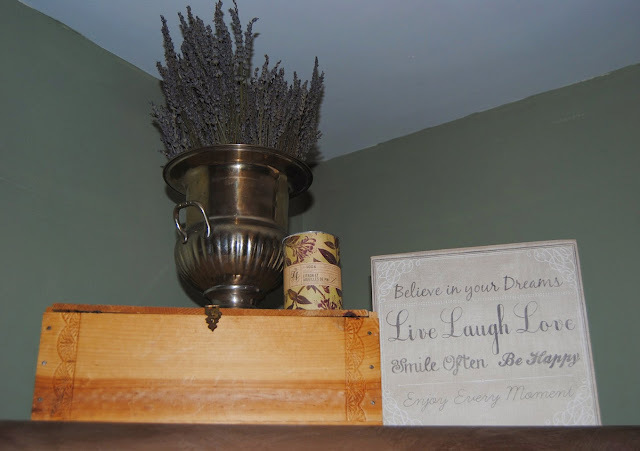 I put some dried lavender into another silver plated container which reminds me of a trophy, and added an inspirational quote, because everyone needs at least one in their bedroom. 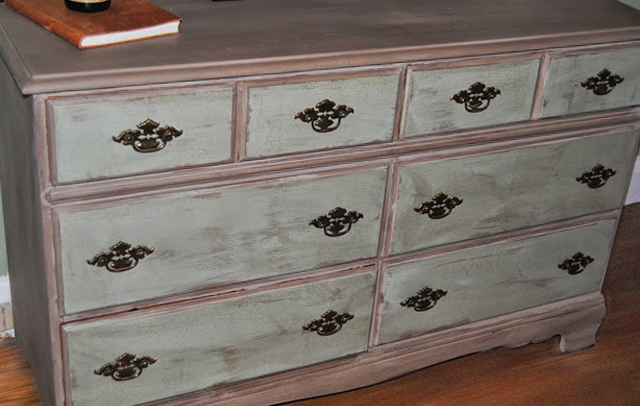 I did the same thing to the front of the dresser drawers that I did to the night stand. I used a crackle medium made by artisan enhancements. It was very easy to use. 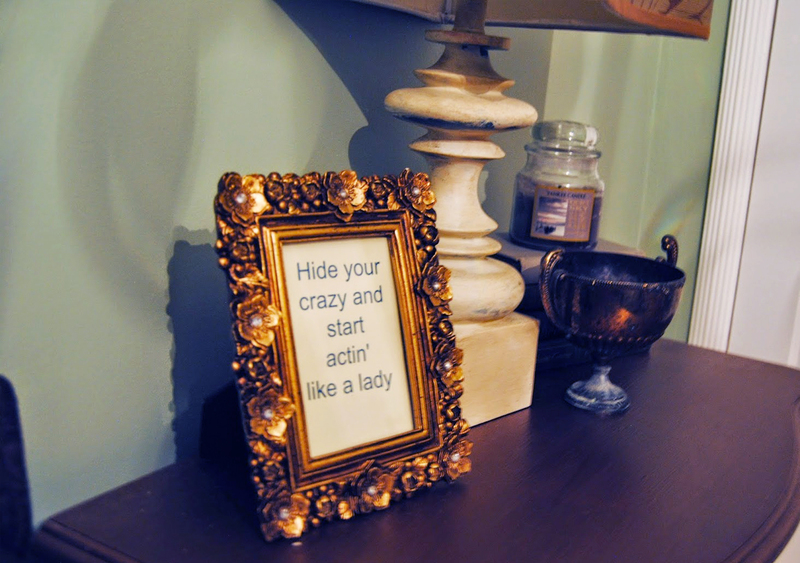 I got that cute frame from Ross for $3.99, and I added another inspirational quote that is an inside joke for myself. I hope you enjoyed my master bedroom redo. Remember, don't always put yourself last. Kids are important but so is your well being. A well rested Mommy is always a good thing. You must feel very proud of this bedroom! You put a lot of work into it. It feels cozy and homey. I really need to get my bedroom on the same level. LOL. You've seen mine. Looks like I just moved in last week. Maybe my new Shaw rug (if it ever GETS here.....) will go in my bedroom to warm it up. If I put it in my family room, it's subject to mac and cheese mashed into it.... LOL. Anyhow, great job! It looks FABULOUS! I have now lived in my house for five years and have done pretty much nothing with our bedroom. You made me think hard about that...I think it's high time I change that! Lara, you should do your master bedroom, since I have done mine I can relax in there more, and it feels better when I go to bed. I spray lavender linen spray in there when I change the sheets, it makes it smell relaxing too!! Great job Jodi! I love the colours and it looks so peaceful. You'll also need to know where to buy your bedroom furniture. There are several places such as large bedroom stores.